Croupier Teddy Bear by Steiff. This beautiful limited edition piece in blond mohair, is fully jointed, carries the white ear tag, which signifies it as a Steiff limited edition and wears the famous gold plated button in ear, Limited edition of only 1111 pieces worldwide. Product details: safety eyes, synthetic filling material, non growler, total size 35cm. Comes boxed, together with a numbered certificate of authenticity. "Rien ne va plus!" When Croupier Teddy bear sets the ball rolling, nerves at the roulette table are stretched to breaking point. He, however, remains the soul of composure: a pro., incorruptible and experienced. 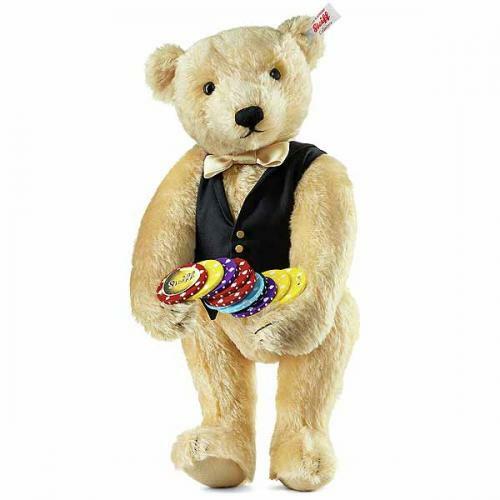 Croupier Teddy bear, who is 35 cm tall and adorned with a gold-plated "Button in Ear", is 5-way jointed. In his hands, he holds unique roulette chips with an imprinted Steiff button. His black fabric waistcoat with three gold buttons and the white satin bow tie contrast elegantly with the fine, blond coloured mohair. "27 - Rouge - Impair - Passe!" A shout of delight... The lady on the far left of the table receives 35 times her bet. Croupier Teddy bear smiles imperceptibly - he shares her joy in his heart.